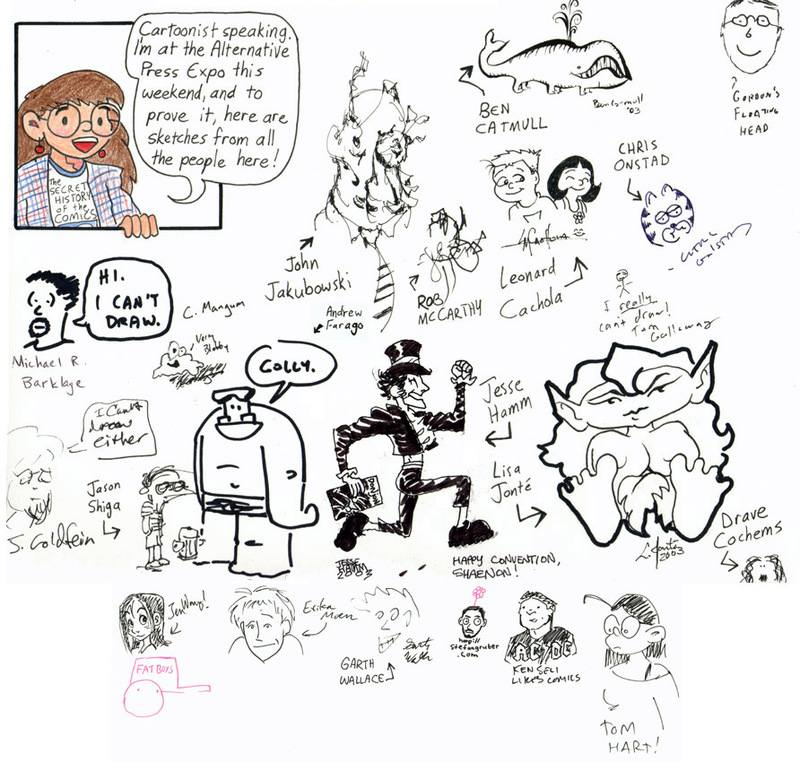 Man, this is a star-studded spectacular of a sketch page. Chris Onstad drew me a Garfield! Tom Hart drew Mell! I really like Jesse Hamm’s HappyGoth there in the center and Ben Catmull’s six-footed whale. Don’t know what’s up with all the people saying they can’t draw, though. As I’ve mentioned in the past, Andrew and I made T-shirts for our first several APEs. The shirt I’m wearing in the top panel is the 2003 shirt. “The Secret History of the Comics” was a zine Andrew made of imaginary comics history, including his classic story “Jesus’s Friend Jimmy Olsen” (a.k.a. “Superman’s Friend Jesus Christ”). In Andrew’s defense, he was raised in some kind of Star Trek environment without organized religion and doesn’t really understand who Jesus is. Meanwhile, I just went through nine years’ worth of my old notebooks, and I found a bunch of things that may or may not be of interest to Narbonic readers. People keep asking how far in advance I worked out various plots. To give you an idea of how the story developed, here’s a list of Narbonic plotlines I made early in 2001 (you can tell by the storylines I have checked off). SPOILERS FOR “SWORD OF SHANNARA” AHEAD! NO! SPOILERS FOR “NARBONIC” AHEAD! I freely admit I don’t remember what all of these storylines were. “Dave Gets a Date” was apparently an early title for “Gender Swap,” I guess because Dave went on a date with Seth in that one. “Mr. Nim” involved the lab dealing with an inspector of some kind; it wasn’t very good. “Gift of the Maddies” was, unsurprisingly, a Christmas story. At one point I was planning to do a Christmas storyline every year, and I ended up not doing any. I had completely forgotten that at one point “Demons” was called “From Hell It Splatted.” I should’ve stuck with the earlier title. I don’t remember what “Picnics and Precognition” was about, but it was on the list for a long time. “Booth Babes” was part of the lineup from the very beginning, went through endless mutations, and somehow got folded into “Professor Madblood and the Lovelace Affair” (which, as loyal readers may recall, includes one  strip about booth babes). And here’s a list from 2003, at the time “Doppelganger Gambit” was running. The Christmas party ended up becoming a Valentine’s Day party because “Doppelganger Gambit” and “Unstuck in Time” ran long. Nonetheless, you can tell that by 2003 I had most of the story plotted out. This is pretty close to the way things shook out in the strip. The only storylines this list is missing are “Angels” and the Zeta and hamster arcs, which I mostly made up as I went along. I even drew Human!Artie in the margin, although this was when he had shorter dreadlocks. As you can see, I was kind of pleased with it. Given the outcome of the Demon’s story, a Velentine’s Day party was pretty apt. You’re right – Frankenstein and Watchmen do prove the efficacy of stark, sterile polar regions as settings for final confrontations. Ka-chow? Do you also steal liberally from Don Martin? Well, I’m glad you went with the change on the last Madblood story. “Professor Madblood and the Everlasting Ices of the North” is quite possibly my favorite Title of any of the Narbonic Story Arcs. It’s good to see the Mad Cartoonist is also well-represented in the unabridged list of Insane Professionals. I’m so happy I added that “Sword of Shannara” thing to your personal lexicon. Yes, the “Sword of Shannara” thing came from an email Jeffrey wrote that included the line WARNING! SPOILERS FOR “SWORD OF SHANNARA” AHEAD!, which I found (and continue to find) endlessly hilarious. Why did you have to end Narbonic? Now I want to see that parody of The Prisoner in the worst way!!! What would it take to get you to start this comic back up again?